I have to say, it’s been hard to keep up with sewing the blocks each month. I didn’t realized how hard it would be! But I do love getting to try new kinds of blocks and seeing other people’s color combinations. 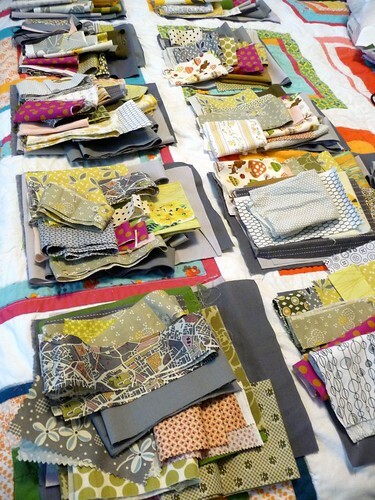 For my quilt, I picked a lot of grays, greens and yellows, and posted some bauhaus textiles as inspiration (see my post for more info). I haven’t sewn anything (other than the quilt blocks for the bee) in so long!! Well, I’ve sewn a few small things here and there, but it seems like a long long time since I sat at the machine. And I have another quilt I need to get to work on as well, so hopefully one of these days I’ll get my sewing mojo back. I have a feeling it may happen after I…unearth the machine from all of the STUFF that inevitably goes on any flat surface in my craft room. It’s funny, this room is much bigger than my last craft room, but it also has an extra bed in it, so it can feel pretty tiny at times. (However, the bed comes in handy for blocking things, and you know, as a flat surface to catch my STUFF). I really need to get organized again! You are absolutely right about any flat surface getting covered up with my projects! My husband has never been able to understand this, but he doesn't create either. Great color choices for your quilt fabric! To me, sewing is such a chore if my stuff is all disorganized.